The education system is teetering on the brink of collapse. This generation of children are facing the loss of their education and their future,” said Mostafe Abdul Rahim, the Advisor to the Minister of Education. 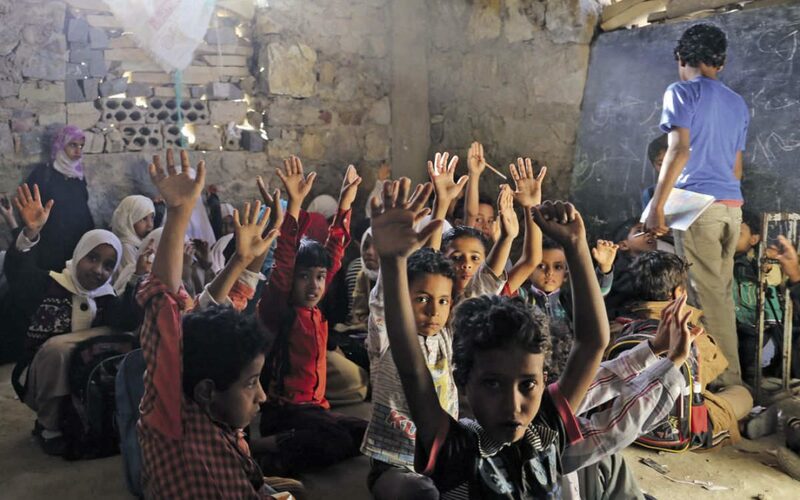 The Yemeni Network for Rights and Freedoms reported that 75% of the educational facilities are shutting down, leaving nearly two million students deprived of education. More than 1,500 education facilities have been destroyed as a result of the ongoing war. The report confirmed that the Houthi group transformed 352 private and governmental institutions (schools, universities, and institutes) into military barracks and weapons depots. Moreover, the Houthi group transformed about 276 schools into a shelter for IDPs. “There is a systematic collapse of the education process caused by the Houthi group. However, the legal government still lacks the basic programs to overcome this problem. 90% of the teachers and educators are without salary and more than 30% of students flee their homes and there isn’t a solution to continue their education. There is a deliberate process to destroy education,” according to Abdul Rahim. Houthis are working to spread their agenda in the schools they run to exploit unwitting children into recruitment. They work to have an ignorant generation fighting with them,” said Yahya Al-Ahmadi, a media activist. “It is the real catastrophe for the future of Yemen. The legal government should have a real plan to address this problem and face this educational catastrophe”, Abdul Rahim added. Education has been severely disrupted in the war-torn country and the students and their teachers face ongoing risks. The crisis has deprived millions of children of education in the region, many of whom have become refugees due to the violent and dangerous conflict.